Summer is almost here! Looking for some fresh design ideas? Celebrity Interior Designer Cathy Hobbs Shares Summer Design Tips With Cotton Candy Magazine! ≈ Comments Off on Summer is almost here! Looking for some fresh design ideas? 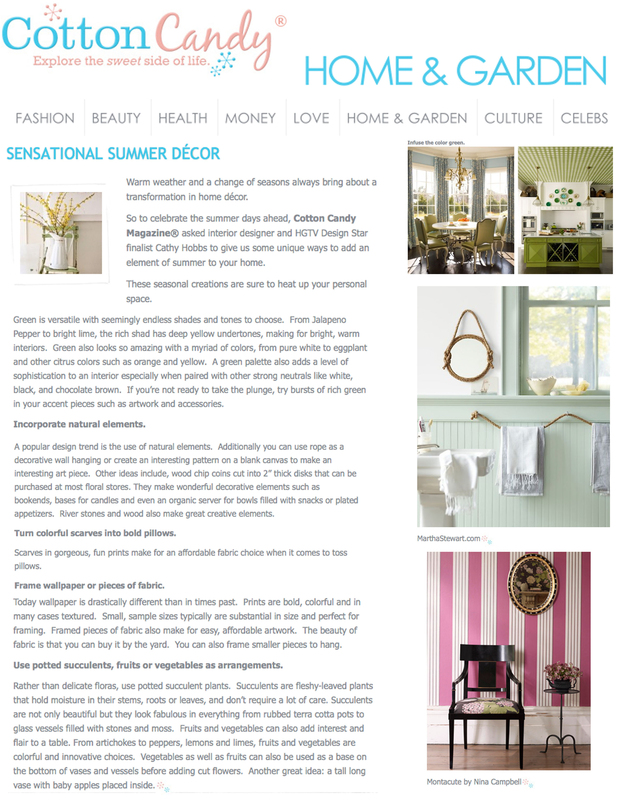 Celebrity Interior Designer Cathy Hobbs Shares Summer Design Tips With Cotton Candy Magazine! My absolute favorite season of all is the summer! I not only love the beach and summer weather, but many of the fabrics, prints, patterns and colors that are distinctly “summer”. Recently, the popular shelter publication Cotton Candy Magazine asked me to share some of my summer tips.